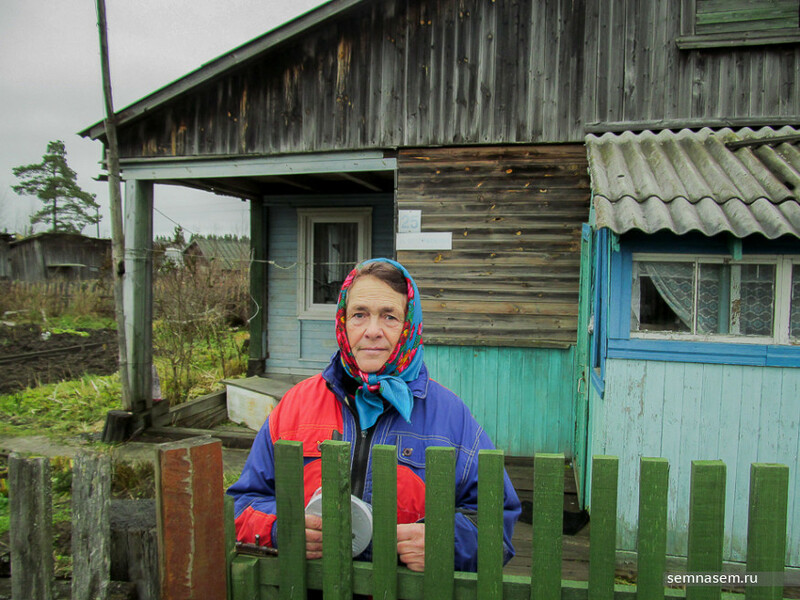 Galina Ryaziyeva, a pensioner living in the Karelian village of Käppäselgä, is afraid the roof of her home might collapse. The adjacent flats are dilapidated and are pulling the only remaining habitable section of the wooden barracks down with them. A lawsuit filed against the district council, which owns most of the house, has dragged on. Our correspondent tried to get to the bottom of the story. Käppäselgä is located the backwoods of the Kondopoga District. It is not just that you can encounter real bears in the village but also that it is one of the district’s northernmost corners. It is closer to the town of Medvezhyegorsk [Bear Hill] than the district’s seat, Kondopoga. Despite the seeming proximity of the Kola Highway, it is no easy trick getting to Käppäselgä, due to twenty kilometers of dirt road, reduced to rubble by lumber trucks. It took us three hours to drive to Käppäselgä from Petrozavodsk, capital of the Republic of Karelia. The last hour of the trip was spent traveling over those twenty kilometers of dirt road. Socially, the circumstances in Käppäselgä are typical of Karelian villages. Nearly all the young people have left for the city long ago. There are ever fewer jobs available, and children can study at the local school only until the ninth form. The housing stock consists entirely of wooden houses. The amenities are outside, and fresh water is truck into the villaged. When a house is uninhabited, it rapidly deteriorates, and the roof eventually caves in. Currently, there are many such dilapidated barracks-style houses in Käppäselgä. There are also problems with transportation. A commuter train used to run twice a day (Käppäselgä has its own train station), but several years ago the schedule was reduced to once a day. So, if they want to go to Kondopoga or Petrozavodsky, villagers have to be at the station at four in the morning. The bus runs only once a week. Ramshackle roofs, broken windows, and empty houses are a common sight in Käppäselgä. Given these conditions, living in Käppäselgä is an accomplishment in itself. But the villagers face another obstacle: the unwillingness of the district council, which owns a considerable portion of the housing stock, to fulfill its responsibilities. “I’m still afraid to sleep at night, because when the roof collapsed, it made such a racket. I jumped out of bed. I couldn’t understand what the cracklonging noise was. I went up to the attic. I could see my part of the roof was still intact, but the rest of the roof had collapsed into the flat next door,” said Ryaziyeva. Ryaziyeva is sixty-two years old. She has had a stroke, suffers from diabetes and hypertension, and lives in a wooden house whose roof, she argues, could collapse at any moment due to inaction by the district council. All the locals know Ryaziyeva: she worked at the local hospital for several decades. In the early 1980s, she and her husband moved into a four-flat wooden barracks, built in 1953, on Central Street. In 1984, the house was refurbished. The common corridor shared by the flats was removed, but the roof was not repanelled and reshingled. Consequently, for many years the roof would leak after heavy rains, dousing “either the ceiling lamp or the sofa.” In the 2000s, Ryaziyeva managed to get the council to repair the roof by threatening to take them to court, but according to her, the roofers the council hired for the job repaired only her portion of the roof, and slipped the old roof slats back under the new shingles. There has not been a thorough renovation since then, and repairs that were carried out from time to time, such as replacing the window frames, were done by the residents themselves. Several years ago, when there was a hullabaloo about the nationwide housing privatization program’s coming to an end, Ryaziyeva privatized her flat. The other three flats in the house remained the council’s property. Ryaziyeva now lives alone in the deserted barracks. Her children, grown up, have moved to the city, and her neighbors have either moved away, died or gone to prison. So, the other flats in the house are uninhabited and unheated, and so they are falling apart. 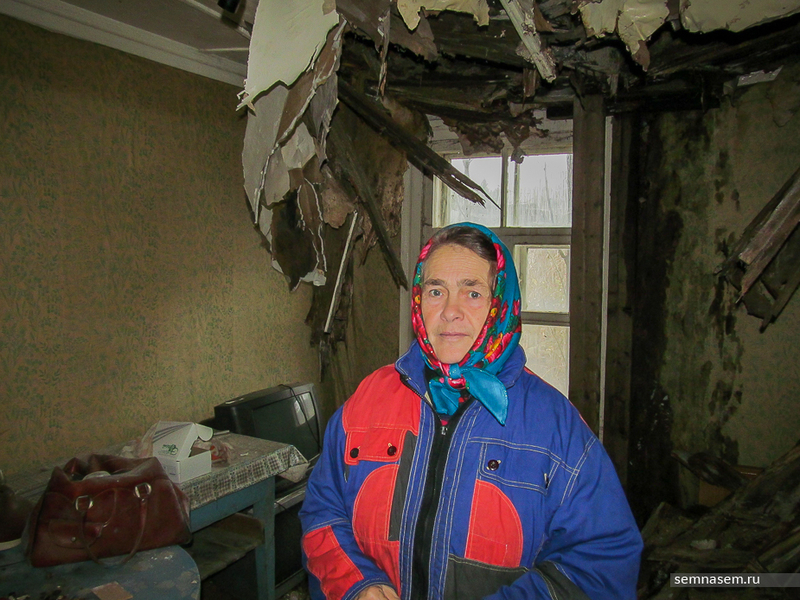 The damage is so extensive that the roof in one flat has collapsed: this was the incident described by Ryaziyeva, above, when a terrible racket woke her up in the middle of the night. There is still serious danger that the rotten section of the roof above the empty flats will collapse, taking the roof over Ryaziyeva’s flat down with them. She has had to close two rooms in her own flat. The furnaces in those rooms, adjacent to the flats next door, could no longer be heated. The cold and damp swelled the wallpaper on the walls, and the window frames sagged and succumbed to rot. There is another problem. Uninvited guests have taken to visiting the uninhabited part of the house. 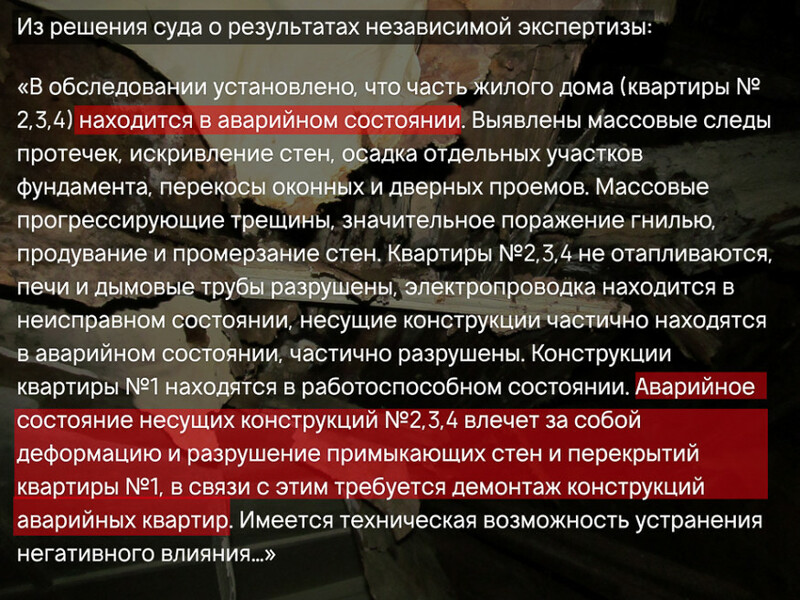 The letter even mentioned a specific estimate of the repair’s cost: 300,000 rubles [approx. 4,300 euros]. According to Yelena Paltseva, who represented the Ryaziyev family in court, this figure was also mentioned later in the process. However, an independent inspection, which the family later commissioned, showed that more money would be required to rebuild the house. Spring and summer came and went, but no work was done. Ryaziyeva appealed to Parfyonchikov’s community liaison office on several occasions, and Anna Lopatkina and Andrei Pogodin insisted she file a lawsuit, which she finally did. The independent inspection determined the list of repairs necessary to save the Ryaziyev family flat. While reconstructing the house, it would be necessary to separate their portion of the house from the other, uninhabited parts of house, which would involve dismantling the chimneys and removing the roof, and then partly restoring the roof, the walls, and the foundation. Currently, assessors have evaluated the physical state of their flat as unsatisfactory: “It can be inhabited provided capital repairs and reconstruction are carried out.” The work should cost approximately 400,000 rubles. The district council has questioned the outcome of the assessment. In court, however, the defense refrained from challenging the assessment’s objectivity. The adjacent flats are in this condition. The trial spanned several hearings. The plaintiff was present for all of them except the final hearing. Ryaziyeva would often have to get up at night, in the dark, to go to the train station to catch the train that would bring her to Kondopoga at five in the morning—sometimes only to hear that the defendant was not ready for the hearing and had asked it be postponed. “Those trips have really worn me out over the past two years,” Ryaziyeva confesses. In turn, Paltseva claims the defense sometimes came to hearings unprepared. “For example, we wanted to hear the testimony of the engineer who had declared the house dilapidated. But we were constantly offered supposedly valid reasons why he could not make it to the trial. Since their lawyer was not an engineer, he could not comment on certain matters, and he would ask that the hearings be postponed. I think they were dragging things out,” says Paltseva. Judge Olga Sysoyeva personally traveled to Käppäselgä and saw the picture with her own eyes, a picture that had earlier consisted only of testimony, documents, and photographs. The condition of the roof worries Ryaziyeva most of all. The Ryaziyevs won the lawsuit. According to the court, it was the district council’s inaction, which has the three empty flats on its books, that reduced the house to its current condition. “The court has sufficient grounds to conclude there is a causal link between the condition of the residential building and inaction on the part of the proprietor of the council flats and the common property in the house, who has failed to carry out capital repairs,” reads the court’s ruling. Taking into account the nature and scope of the reconstruction work and the time needed to complete it, the court set a deadline: three months from the day the ruling entered into legal force. During the trial, the defense attorney requested the Ryaziyevs should, in keeping with their share of the house’s overall floor space, pay 33% of the repairs. The court declined the request. Commenting on the situation, deputy district head Kirpu repeated the demand that the Ryaziyevs co-finance the repairs, as indicated in the appellate complaint. When we asked him why no such demand had been made when he issued the decree, which was never carried out, to demolish the dilapidated flats during the spring or summer of 2017, he found it difficult to respond. “Our lawyers vet every decree. Maybe someone overlooked something,” Kirpu speculated. Moreover, at the end of our conversation, Kirpu informed me that money for reconstruction of the house (around 500,000 rubles) had been found among the district’s nonappropriated funds, but they had not been allocated, because the Ryaziyevs had filed suit against the council. Galina Ryaziyeva has to take care of her half of the house and the adjoining half of the house. This means that 25 Central Street will have to survive yet another winter. Who knows whether the roof will hold out or the lintel will collapse. According to the Ryaziyevs, the the local council has deliberately delayed the process so that there will be nothing left to save and restore.